DON VAN DYKE has decided to step down as the bass player of the Cheeseburgers. This makes us sad, but we understand and wish him well. I joined the Cheeseburgers six years ago. Kirk Gribbler and I are the only ones left. This will be the fifth new guy in the band since I've joined. It's the nature of the beast, and we simply move on, adapt and figure it out. DVD was all Cheese, all the time. I had a long discussion with a guy at the Elks Lodge Saturday night after another really fun gig. He commented about how good we sounded and how much fun we were having, and it made me feel good, because the two go hand in hand. If you don't enjoy it, you shouldn't do it. Period. Right now the Cheeseburgers are playing as well as we ever have and we are really having fun. We have found the groove and nobody in the band takes themselves seriously. We are open to new songs, new ideas and new ways to be goofy and entertain, and I'm loving the heck out of it. DVD is not leaving because he's not having fun. I think he enjoys playing with us. But he's got two young kids, a demanding job and he plays in another band. Sometimes you have to make choices. The fact he's choosing a soccer field or basketball gym instead of us is not only fine, it's the right thing to do. His other band plays a lot more than we do, so it's totally understandable. I will miss him. Don is quiet but his sense of humor is deadly and I defy anybody to do a better Ahnold movie impression ("DA BLIDGE IS OWEEUT.") We 'll be coming home from a gig and it will be quiet in the Suburban, and suddenly Don will say something out of left field and we will all be in convulsions. We've recruited Justin Sievert to take his place. Justin played several Cheeseburger gigs last year when Don was not available, and I play with him in Pepper Spray. 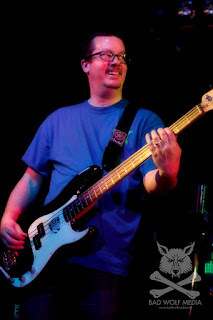 He is an amazing bass player and a good singer too, and he fits right in with us. Right now we don't have a lot planned after this Saturday's Fabulous Fur Ball gig, but I'm sure we'll be picking up steam as the year moves on. Thanks for hanging with us, DVD. You made the harder parts of playing, like setting up, tearing down, practicing and regrouping, much more tolerable. You are an excellent player and I encourage you to keep playing as much as you can, while keeping your priorities in order. Meanwhile, all Cheese ahead, and we'll see you Saturday at the Fur Ball for DVD's final show!